Bubble for Rhino is a free tool from Asuni that displays a tooltip with information of any object in the document. You don’t need to execute a command or click on a button toolbar, just place the mouse cursor over any object, wait a second, and Bubble will show you all the information related to it. You can even choose which information will be shown for every object type. Bubble for Rhino is available for the Windows versions of Rhinoceros 4.0, Rhinoceros 5.0 (32-bit and 64-bit) and Rhinoceros 6.0. Bubble for Rhino is currently in development. We still have to add many features, but we want you to try and enjoy it while we implement them. Do you have any idea or suggestion? Contact us and let us know. Bubble is free (at no cost) for personal and commercial use. There is no advertising or adware software included with the installer. We only ask you to update it every time a new version is released. You won’t even notice Bubble for Rhino is loaded. It consumes a very small amount of memory and all calculations are done after the cursor is hovered over an object and before the tooltip is shown. Too many properties? Too slow or fast? Don’t worry, you can modify almost every aspect of the tool tip. Is there something you don’t like and you want to change? Contact us, let us know and we’ll try to make it customizable in the following version! Nowadays, almost every element in the screen of modern operating systems and software has a tooltip. Bubble for Rhino adds this feature to any object in a viewport or a layer in the layer list. Get instant information for any object in the document by placing the cursor over it and waiting a moment. You don’t need to run a command or click on a toolbar anymore to know something about an object. Are you tired of failed operations and you don’t know why? Bubble will detect bad objects and show you what’s wrong with them. Here you can download the installer for the latest version of Bubble for Rhino. Please check the requirements for your platform. WARNING: Bubble for Rhino is in WIP (Work In Progress) stage, which means it is still in development and it may fail. Public downloads have been tested internally in our office, but it may contain unknown bugs. Use it at your own risk. New expire date is 31 January 2020. New expire date is 31 January 2019. Fixed a crash in Rhinoceros 6 when the mouse cursor was outside a viewport and the keys were pressed. Added support for referenced objects (worksessions or linked blocks). 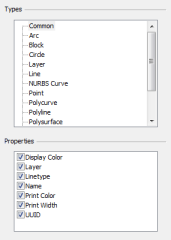 Layer field includes full layer hierarchy. Added support for user text fields. Attributes have been grouped in a category. Fixed: objects were shown as invalid inside BlockEdit command. Added support for scaled screens. 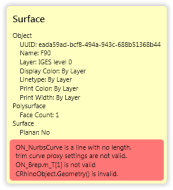 Shadow was not displayed on Rhino 5. Microsoft .NET Framework 3.5 SP1 is now required. The mouse cursor shows a help question mark when the required modifier keys are pressed. Rhinoceros 5.0 (2012-09-27 or newer) is now required. Rhinoceros 5.0 (2012-05-14 or newer) is now required. Rhinoceros 5.0 (2012-01-17 or newer) is now required. Added Edge Count property in polysurface object. Added an option to select which modifier key combination activates Bubble. Added an option to disable Bubble when a command is running, there is an object selected or the user is panning, zooming or rotating the viewport. Fixed shading of highlighted objects in Rhino 5.0. Fixed picked object highlight on Technical and RenderedShadows display modes in Rhino 5.0. Added support for new Rhino 5.0 (64-bit) VS2010 Transition Build. New expire date is 31th March 2011. New expire date is 30th November 2010. Added support for new Rhino 5.0 tabbed layer manager. 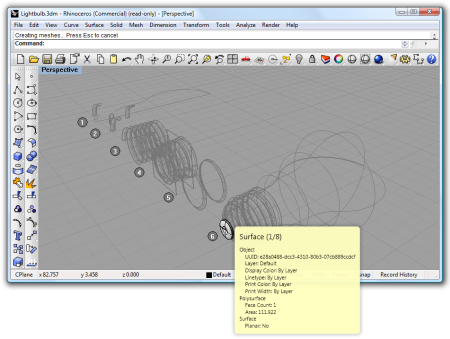 Check if .NET Framework 4.0 is used in Rhino 5.0 version, because this version of Bubble is not yet compatible with it. To load Bubble, it is necessary to disable .NET Framework 4.0 running the command TestDotNetRuntime. New expire date is 31th October 2010. Nothing. Bubble for Rhino is free (at no cost) for personal and commercial use. Why 3.0 is the first version and what happened to 1.0 and 2.0? Bubble has been a widely used tool for AutoCAD platform since year 2000. Starting at version 3.0, Bubble will work on Rhino too. Is Bubble for AutoCAD dead? No, it isn’t. Bubble for AutoCAD will be updated to version 3.0 soon. Can I share the Bubble for Rhino installer with my friends? Yes, you can, and we’ll be very grateful. We want as many people as possible to use Bubble. Does Bubble modify the document? No, is doesn’t. Bubble is a read-only plug-in, and it will not modify any document you may open. Will Bubble show information for any object in the document? No, it won’t. The current version only supports the most common and native object in Rhino. Objects from other plug-ins and visual glyphs (like grids, axis icon, etc.) are not supported. Can I change which properties are shown in the tooltip? Yes, you can. All customizable options are inside the Rhino options dialog. Is it possible to change the order of the shown properties? No, currently it is not possible, but it’ll be in a future version. I’m a Rhino plug-in developer. Can I extend Bubble for Rhino to show properties for my plug-in objects as in the AutoCAD version? No, you can’t do it right now. We want to create an SDK for Bubble for Rhino to allow plug-ins to extend it adding new properties for document objects or adding support for more kinds of UI elements (toolbars, dialogs, etc.). We need to reach a more stable and feature-complete version of Bubble to make this SDK public. May I promote Bubble in my page/blog? Yes, of course! As a recommendation, you should use a link to the Bubble home page with the following image.